Fill and finish is the final manufacturing step in creating an aseptic drug product. Aseptic liquid filling requires highly technical driven processes to ensure a sterile and safe product is administered to the patient. We provide GMP certified production capabilities with an automated filling line, processing over a million vials per year. Viral biological products for which BSL2 conditions are required, can be filled manually. 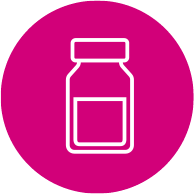 Fill and finish activities of your drug product can be complemented with customized labelling and packaging. Fill and freeze drying is often applied as a dehydration process to extend the shelf life and stability of the product. HALIX offers lyophilization services from the development of a lyophilization cycle up to industrial lyophilization. The lyophilization cycle development is performed freeze drying in a small scale pilot dryer of 0.5 m2 plate, or in our industrial lyophilizer of 5.2 m2 plate. In the case of very small batches we can also perform manual filling for drug product manufacturing from clinical to commercial scale. The HALIX service package offers terminal sterilization including 100% visual inspection of the vials using polarized light, labelling and packaging, and QP batch certification. Depending on our client’s situation and preferences we offer a highly flexible package of services and adapt them individually to your requirements. We start with a technical assessment of your manufacturing project, and transfer your needs into our production process or into the set-up of our facility. HALIX ensures GMP confirm drug production and a successful enforcement into your clinical program. All filling activities are subject to visual inspection and comply with the EMA requirements for GMP manufacturing. The HALIX facility is specialized for aseptic filling and lyophilization. Using a modern automated filling line in grade B and A clean room conditions, the facility is capable to handle many different liquid packaging solutions. The filling line has a 100% in-line weighing of empty and filled vials. Validated vials sizes from 2RDIN, 6RDIN, 10RDIN, 15RDIN to 50 ml vials can be processed. The batch sizes vary from 100 to 20.000 vials per batch. Unique coding on the aluminum cap of the vials makes every vial identifiable. HALIX aims to keep losses in bulk substance due to fill and finish at a minimum. If your company needs support in liquid filling or lyophilization for clinical or commercial scale, feel free to contact HALIX for a first technical assessment.